Ethnically diverse and the most vibrant north-eastern state of India, Assam is in a way defined by the mighty river Brahmaputra whose valleys along with those of Barak river have been the habitat for thousands of flora and fauna including wild animals. Nestled in the southern side of eastern Himalayan ranges, Assam is spread over 79,000 sq km with a population of 3 crore made up of many ethnic people drawn from multiple races. The Karbi Anglong and the North Cachar Hills have a number of tribes and sub-regional groups affiliated to local clans with feudatory kinships. A top performer among the seven sister states of northeast India (other states are Arunachal Pradesh, Nagaland, Manipur, Meghalaya, Tripura and Mizoram), Assam and its contiguous regions are connected to mainland India through a strip of land in West Bengal called the Siliguri Corridor or "Chicken’s Neck". In fact, the Indian Army guards this Chicken’s Neck with regular troops patrol as it is vulnerable to pincer-type attack from the People’s Liberation Army of China. 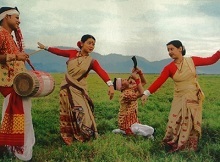 While the state has international borders with Bhutan to the north and Bangladesh to the south, the Assamese have cultural and ethnic affinities with people from the South-East Asia, a region of geostrategic importance to Indian government which has initiated a number of projects as part of 'Act East' policy. This colourful and rich state bubbling with diversity became part of colonial India after the British occupied the fertile region after the First Anglo-Burmese War (1824-26). The world famous Assam tea has become a source of gainful employment to thousands of people as the commodity is exported all over the world and earning the precious foreign exchange. Moreover, the four oil refineries in eastern Assam account for 15% of the country’s total production. The art of silk weaving has been a traditional vocation for Assamese for centuries and the resultant fabric is put to everyday use in each household. After much efforts and time, the Kaziranga and Manas national parks have found remarkable success in the breeding of one-horned rhinoceros, a unique animal found only in Assam. There are other popular wildlife species like the pygmy hog, tiger and a variety of birds that are in existence in the natural habitats and dense forests of the state. The Asian elephants have an amiable place in the wildlife areas of Assam where they roam in groups without the fear of poaching. Due to year-long tourism at wildlife sanctuaries and national parks, the state gets much revenue from this sector which also provides employment to thousands of local youths as the community is involved in the protection of forests and the large eco-system. Both Kaziranga and Manas National Parks are designated as World Heritage Sites for its rich flora and fauna and the success they have achieved in preserving these ancient habitats for wildlife. Sal tree forests are found in abundance which as a result of rainfall looks green throughout the year. The Brahmaputra river with its tributaries and the oxbow lakes provide this region with a hydro-geomorphic land pattern which has a district charm that is quite unique to Assam. The precise etymology of "Assam" is unknown. During the classical period and up to the 12th century the region east of the Karatoya river, largely matching the present-day Assam, was called Kamarupa and Pragjyotisha. In medieval times, the Mughals used the terms “Asham” (eastern Assam) and “Kamrup” (western Assam) which during the British colonial era morphed into "Assam". While a section of historians and litterateurs had associated the state name with 13th century Shan invaders, the exact origin of Assam is still not clear. But Sanskrit pundits say the word “Asama” (unequalled or peerless) was the root word for “Assam”, this suggestion was rejected by renowned scholar Banikanta Kakati. The recent authors have agreed that Assam is a possible Sanskritisation of a native name that have come from Tai (“A-Cham”) and Bodo (“Ha-Sam”) ethnic groups. Assam is most improved state. Its GDP wise rank is 19, area wise it ranks 17 and population wise is holds 15 rank. Health expenditure is up by Rs 363 per person. Among top three states it tops in government registered doctors. Here infant mortality has dropped by 5 percent between 2013 and 2014.